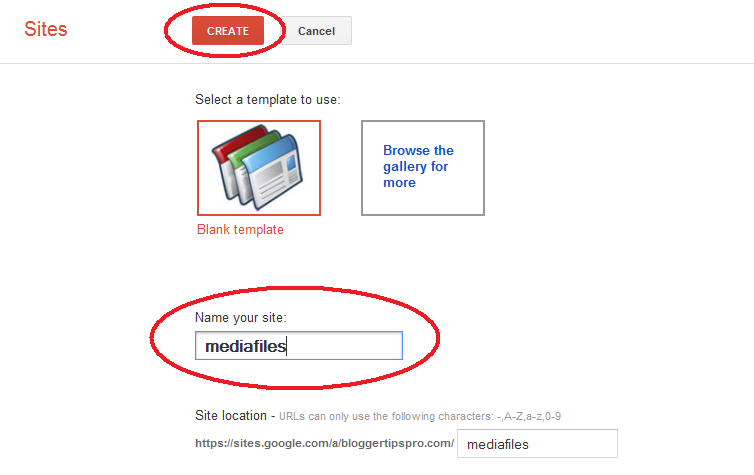 NEWS NOTE: Be aware that Google Sites modernized in 2017 so using it as storage for your files may change. You may jump to Part 3 and look at options 3 or 4 to use Google Drive or Dropbox instead. Dropbox seems the most promising in 2019. One nagging theme that consistently bothers Blogger users is the lack of storage available for file types other than images and videos when attempting to expand your blog. I don't know how many times I've seen users asking for upload storage for PowerPoint slides, PDF files, databases, etc. Probably the single most popular request is "how can I upload a MP3 file to Blogger and embed it in a flash player?" without some odd widget or custom call-out. The reason why the MP3 request is called out so often is mainly due to the desire to have either music or podcasts directly embedded in your posts. 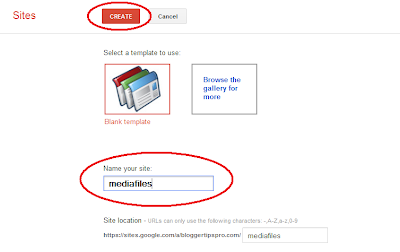 What many Blogger users don't realize is that by registering as a Google user, you have many of their tools at your disposal--including the not so obvious ability to utilize free Google storage (which translates directly to the ability to upload MP3 files). Now, uploading a MP3 file to Blogger is not a direct upload through the Blogger interface but is very easy with just a few steps to get you there quickly. So, let's get started!! So, just what is a Google Site? Sites is a free website building tool that Google picked up as an acquisition some years back. It is not overly popular but does have some interesting capabilities. You can use it as a standalone tools to build full, mostly static websites without any hosting fees. In our case we're only using it as a background placeholder. Simply go ahead and choose 'Sites' to get started. You're really not going to use the site builder to build a full website at this point (though you could if wanted), just utilizing some of the storage functionality that Google provides with this tool. You now have the website shell ready to land your MP3 files. But, the default pages are only static ones at this point without any ability to upload or store files. 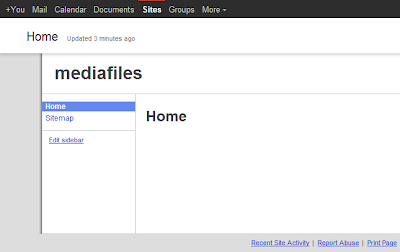 For the last phase of this Part 1 you need to create a certain type of webpage called a 'File Cabinet'. 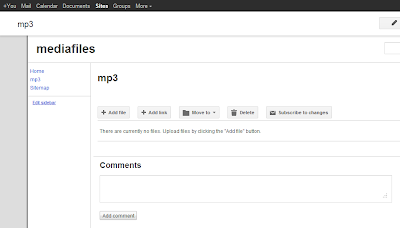 You've now created the needed shell to get your MP3 files to some free storage from Blogger. 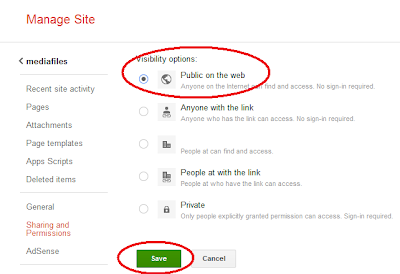 Before you start working with this site, however, you need to follow one last step - setting the visibility of the webpages to be Public. Done!! 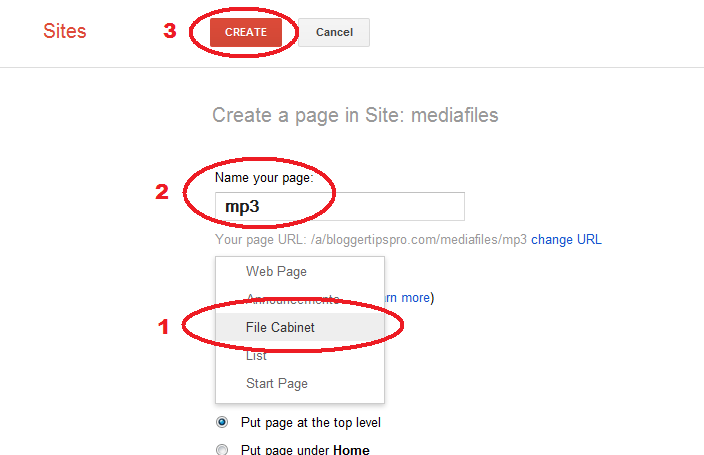 You're now ready to start using Google Sites for your Blogger MP3 files! Since this is only Part 1 please note this is not the final step of the process. You're going to need to do a couple of tricks in Blogger to start using this site. Don't worry -- it is an easy process. Take some time to learn Google Sites (Mary Fran's Getting Started with Google Sites is a good tutorial) some more so you're comfortable with navigating through it. 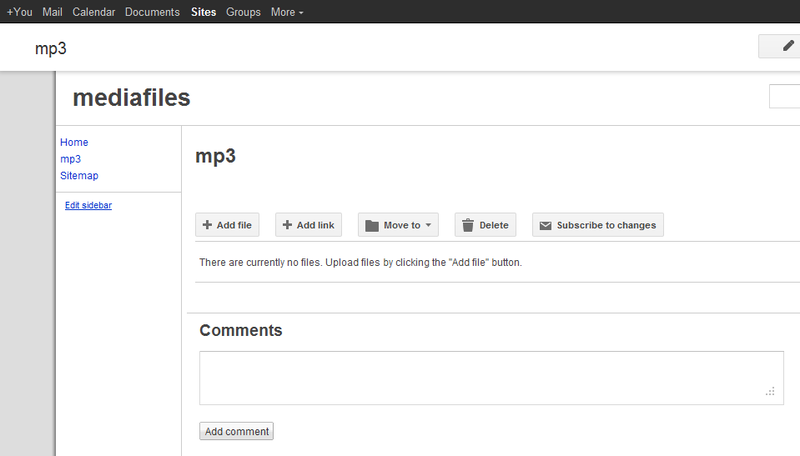 Next up - Creating and Uploading your MP3 files to Google Sites for use on Blogger. 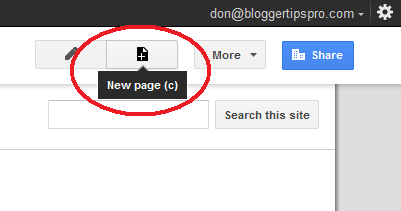 Don just wanted to let you know that the Sites option has been removed from the MORE menu and from Gmail accounts. 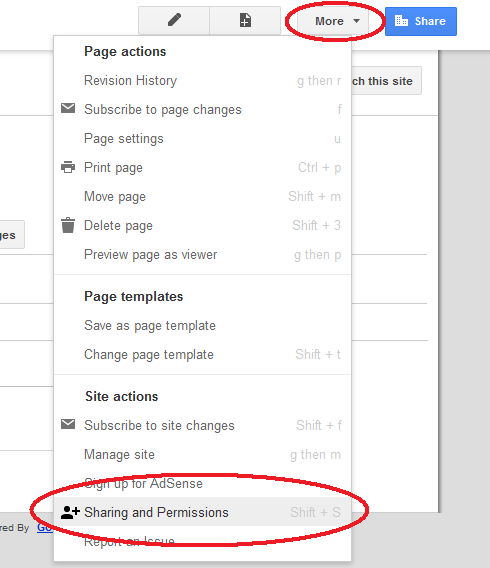 I had to link directly to Google Sites to add another page. Also there doesn't seem to be any limit on the number of pages that you can create, as long as you are below the 5 GB storage limit on Google. Each page can store 100 MB times your total page count. I tested it out with a page for music and a page for PokerStars utility files. Copy this and replace it with your Google Site link to the mp3 file either in the Post you want it to play in or in your template if you want it to play when your blog is visited. That should work! brilliant tip. Just what I wanted. I was struggling with MediaFire MP3 link. I embeded a Google Audio Player gadget on my Google site but cant play any MP3 files stored on my hard drive any suggestions? Glad to hear it will help you out. 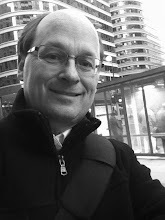 Let me know when you have some poems ready for listening - place a comment here! Taking a look at your blog I would really like to hear them. Nice to know there are still beat poets out there! I'm with you in Rockland! I guess I'm blind. I can't find "Sites" anywhere. Went to More and then to Even More....and nothing. Help. Thanks. 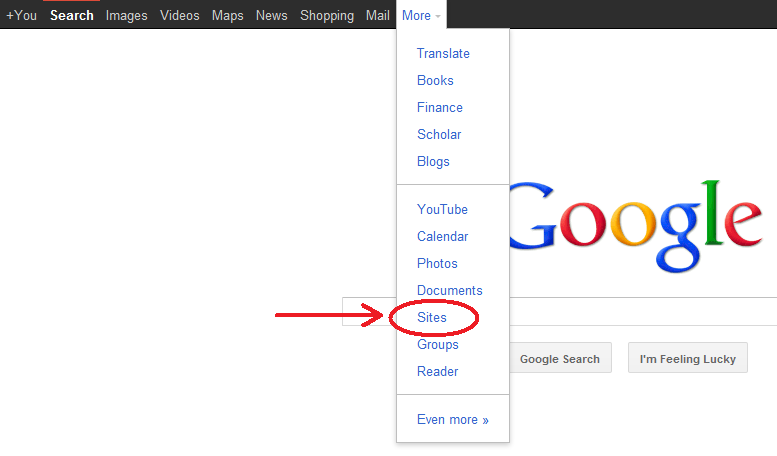 By 'Sites' I'm referring to Google Sites. 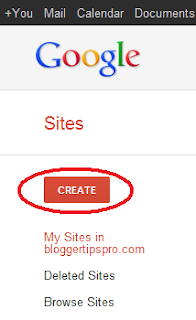 It is a separate application Google offers much like Blogger to create free websites. It allows you to store files. Thanks Don. I got it. 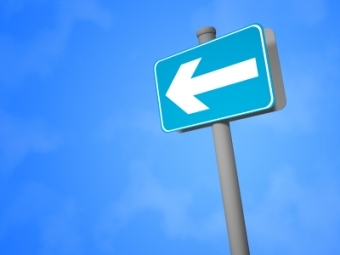 Your link is not a file but a path. You need to have the full name in the path such as .../mediafiles0427/mp3/mysong.mp3 That should fix your problem! Hi, I followed your instructions in removing MP3_LINK_URL and here's the code I got. The application shows in my blogger site but doesn't play. What should I do? Thank you! Depending on where you are attempting to access the player from - it may be blocked by your ISP or company. If you take a look at Part 3 of this tutorial I talk about other player options you can use. Take a look at the very first comment in Part 2 of this tutorial. You'll find my instructions on auto-play there. You've done a wonderful job making this workaround easy to setup. Thank you so much! I took a look last night at your request and didn't find anything yet. DropBox used to allow public links but removed them in October. At one time I was able to use Google Docs (now Google Drive) but since then I can't get that to work either. I have a meeting to go to tomorrow morning and need to load an MP3 file for it. Your willingness to share information is outstanding and so compassionate. You have me on the way to the meeting ahead of schedule! Glad it helped you out!! Hope your meeting goes well. Hei! Don ... i just do as you said and now i have a google site and what i don't know it how can i upload mp3 songs on my blogg in a label? I don't understand your question - upload in a label? 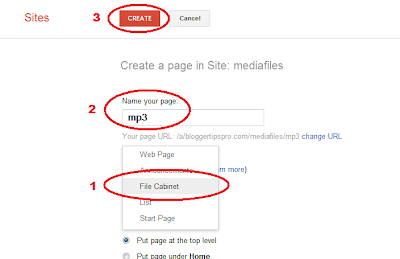 You can upload your songs to Google Sites using the 'Add Files' button at the bottom of the Google Site page that you created in my tutorial above. You have to go to Part 2 of this tutorial to do that. I got this working on two posts on a single blog. I added the code to make it play automatically. However, that created a problem. Since I display the 7 most recent posts, if two of them have embedded audio (set to AUTOPLAY) you hear both audios. on windows 8 native 8 mode of IE, you crash the browser. How can I make this work so it only plays the audio if it is the most recent post of if someone goes directly to a post. BTW, embedding the audio on a PAGE, rather than a POST, works for obvious reasons, only one page can be displayed at a time. I am an English teacher. I want to make recordings of students reading their stories available to other students in the class for comment without having the recordings be public anywhere in the process. Is this possible without paying for a host of a private blog? I would like to add mp3 files to my blog. Yet, when I follow your directions exactly as you state them, I cannot get past the name mediafiles step. When I add the name, it copies in the url section just below it. Then when I select create: I get an error message: The location you have chosen is not available. Please help. I'm not sure what's happening specifically. 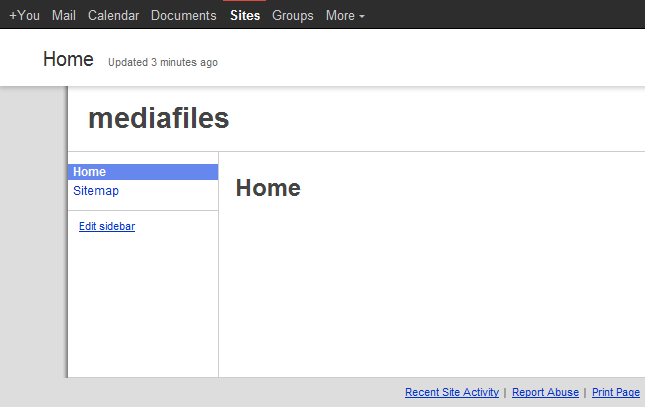 Maybe you should try creating another new Google Site and add the mediafiles page there as a test. It might just be a configuration problem in your Site. can i protect my site from not allowing others to get my access..
Not sure I understand your question. Are you referring to your MP3 files? yes, but google have limit of storage to upload it is the problem, do you have any solution for unlimited storage of file and embed it into blogger. Thank you very much. Well done with the directions. Thanks a million! This is the best! Much thanks. Well finished with the headings. I'd like to load mp3 files to a website and have public access to download them - will this work for that?